The ScienceWISE.info provides scientists with possibilities of article annotation and scientific bookmarking, helping the international community of physicists to generate dynamically, as a part of their everyday work, an interactive semantic environment, containing a field specific concept ontology with direct connections to the body of research papers in physics, available at ArXiv.org (the standard all-physics preprint server since early 1990s). We expect the successful realization of this project to bring several important break-through. Information management in physics faces new additional problems that are very different from those in, say, bioinformatics or even in formal mathematics. A typical starting point in, say, bioinformatics is to identify set of concepts describing elements of some natural "Lego construction set", that are well defined and have a finite set of easily classifiable properties. They are relatively easy to be formalized in an ontology and manipulated automatically using two main abstractions: hierarchies and keywords. However, advances in physics cannot be categorized using those simple abstractions, because they often revolve around sets of complex, rather abstract and hardly formalizable concepts and their non-trivial relationship.Thus, manipulating it automatically requires a fundamental new step in information management, e.g. development of new tools facilitating the elicitation and the automatic manipulation of complex and dynamic knowledge graphs. If achieved, it will allow for a breakthrough in many areas of science, industry and business where a similar expert community with electronic document space exists and a minimal field specific ontology is rather non- trivial. It should be added that, if successful, the first stage of the project will revolutionize research in physics itself, where collaborations involving thousands of people with very different expertise are more and more required and organizing non-trivial information becomes a crucial obstacle for development. The key idea to achieve such a breakthrough is to create a system that is continuously developed, updated and trained by the experts as a part of their daily scientific work. Altogether our system currently contains more than 150 annotated papers. ScienceWISE also provides scientific bookmarking facilities and the icon have been added to the set of bookmarking providers displayed on all abstract pages. 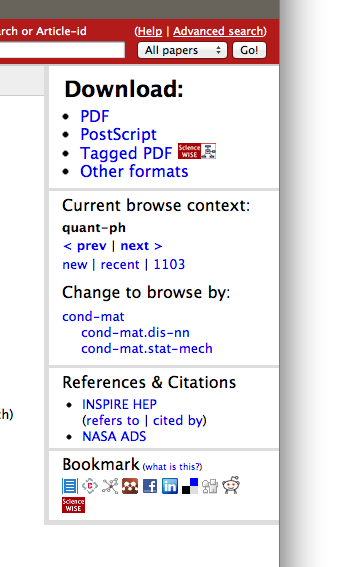 Once you have added several bookmarks on your page, you see the list of bookmarked papers and the minimal list of concepts used to index this papers to bookmark. There is a cloud view, showing all used concepts. However, in the default (list) view one first sees only the minimal set of concepts such that in all bookmarked paper at least one of them is used. Clicking on any one of them narrow the list of papers to those that use this one. The concept filter than narrows down to those concepts that co-occur together with this one only. As a result any paper can be found in 2-3 clicks. Scientists can create their own definitions, explaining important scientific concepts. These definitions are authored, (see e.g. Andreev reflection by Carlo Beenakker or Neutrino Minimal Standard Model by Mikhail Shapohsnikov (click here for the full list of definitions) These definition articles are available for all the authors of regular research papers, as a part of their annotation process. The ScienceWISE project is a collaboration of a group of physicists from the Institute for Theoretical Physics at Swiss Federal Institute of Technology at Lausanne (EPFL), CERN in collaboration with the computer scientists from Distributed Information Systems Laboratory and eXascale Infolab at the University of Fribourg. Our goal is to create an environment that would encourage physics and other scientific communities to dynamically create an encyclopedia and an ontology of the important scientific concepts. Roman Prokofyev, Gianluca Demartini, Philippe Cudré-Mauroux, Alexey Boyarsky, and Oleg Ruchayskiy. Roman Prokofyev, Alexey Boyarsky, Oleg Ruchayskiy, Karl Aberer, Gianluca Demartini, and Philippe Cudré-Mauroux. Karl Aberer, Alexey Boyarsky, Philippe Cudré-Mauroux, Gianluca Demartini, and Oleg Ruchayskiy.